Originally published by The Fifth Column News on Mar 18th, 2015 under a Creative Commons Attribution-Share Alike 3.0 License. Ft. Meade, MD (TFC) – Back in June 2014 I wrote an article; Don’t Ask for your Privacy, Take it back for the Reset the Net campaign. The only reason why mass surveillance works is because most of our communications are being sent in plain text, as easily read as you are reading this very article. Whether this is done willingly by the service provider or maliciously by the Government using devices and exploits without their knowledge, Encryption will keep (some of) your rights in tact, for now. Using Tor outside of a browser and not on the Darknet/.onion network will defeat this attack. Me personally, when I use Tor. I exclude all nodes that reside in a FVEY (Five Eyes) Member country. That is US, CA, AU, UK and NZ. I use an open source project called AdvTor to do this. 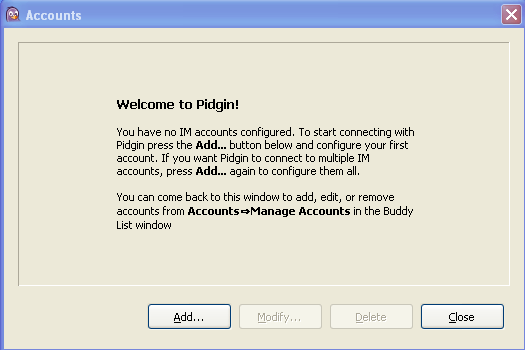 Pidgin is a messaging client that supports numerous protocols. 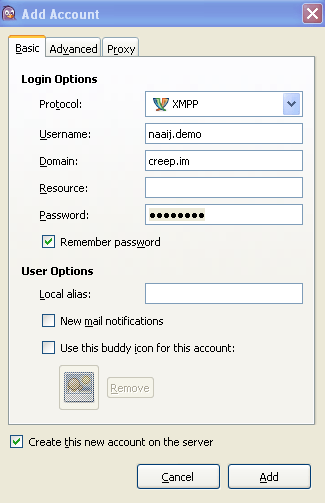 The one I will focus on is XMPP, previously known as Jabber. 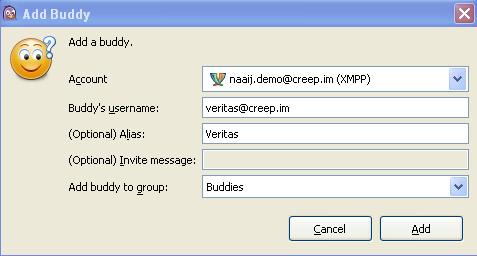 The XMPP server I use is creep.im, You can add me using [email protected]. 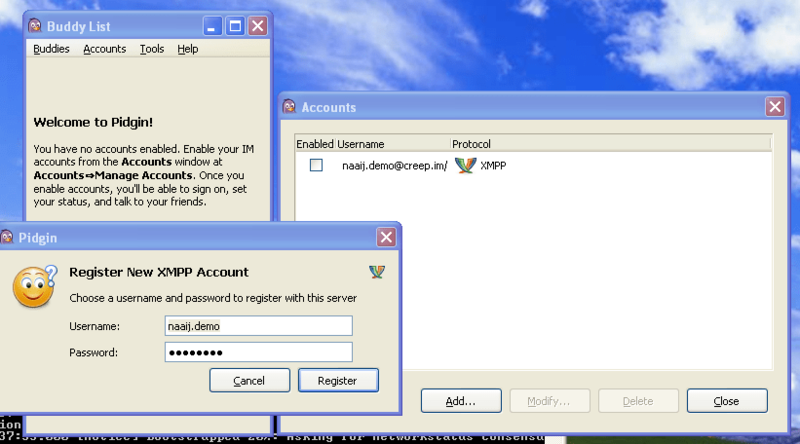 Here is a list of many XMPP servers. There is no reason Pidgin shouldn’t be the MSN or ICQ of this decade. Most people have resigned to using Facebook for their messaging needs, But this is a horribly insecure centralized target for … pretty much everyone. XMPP allows you to use any number of servers in any number of countries to route your conversations thru, all with full encryption. Fill out the form as shown below, using your own username and password. I am using Tor in this example. Simply Install Tor and run it, The defaults will work. If you don’t want to do this, select ‘No Proxy’. The main benefit here with Tor (or any proxy) is maintaining your location security from whomever you selected to handle your chat (creep.im in the example). If all goes well you will get this screen. This is your actual registration so remember your password. Confirmation that all is well. When someone adds you, This is what it will look like. 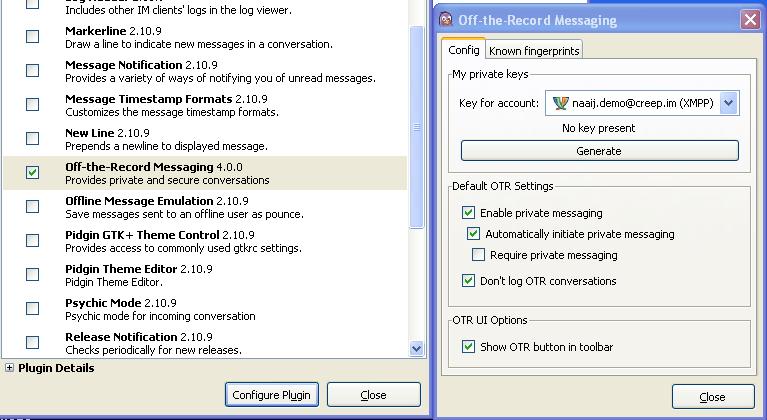 The OTR plugin gives further security by providing even more encryption and buddy authentication via secret phrases and questions. But even just using Pidgin over say regular Facebook is a huge improvement. There are a variety of methods of ‘authenticating’ a buddy. The simplest is ‘Manual Fingerprint Verification’ – For your first time encountering people, this is good. It will ensure that your communicating with the same person on the same machine you originally added. And thats all there is to getting started with Pidgin. A project that is currently in development I’ve been keeping an eye on is uTox. It allows for sharing of your desktop, a webcam, pictures, or just regular chat. All securely with encryption by design. Even better is that it is ‘zero configuration’ – You open it and you start chatting. No account or signup or registration. “With the rise of governmental monitoring programs, Tox, a FOSS initiative, aims to be an easy to use, all-in-one communication platform that ensures their users full privacy and secure message delivery. ← New virus found spreading on Facebook.